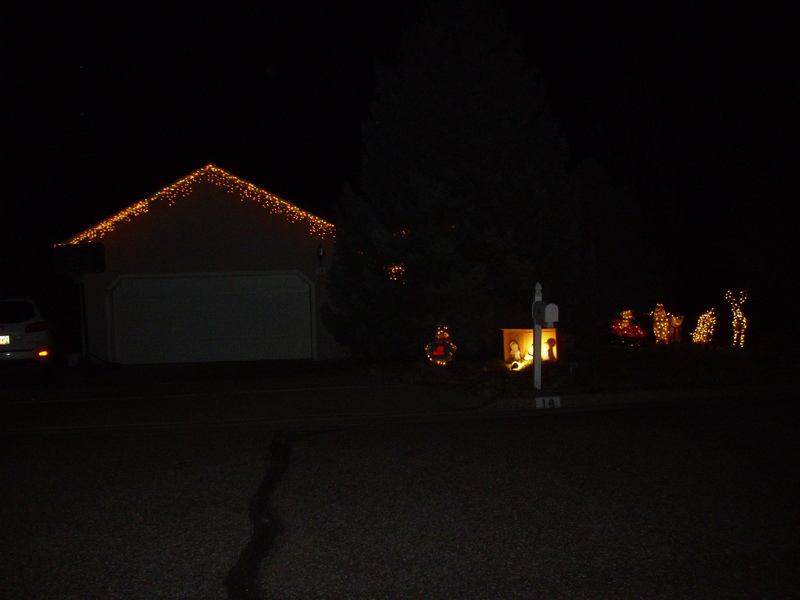 I had a pretty good Thanksgiving, beginning with having Wednesday off (in lieu of my usual 9/80 Friday off) to get the chores out of the way, then a quiet Thursday at home with the family followed by a simple but nice Thanksgiving dinner, then Friday to get the Christmas decorations out. We are keen on that. 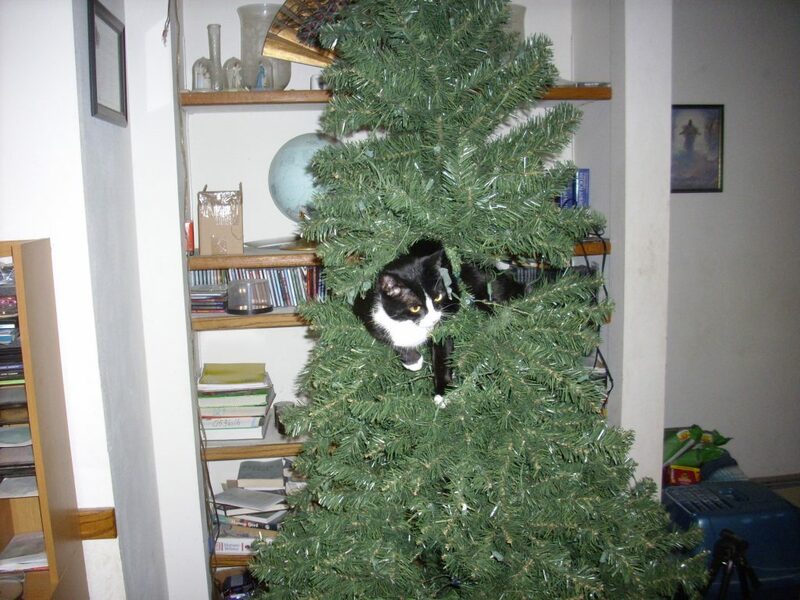 Our littlest cat particularly enjoys the Christmas tree. That still left Saturday to do some hiking. Which did not all go as I might have hoped, beginning with the nearly flawless weather on Friday rapidly deteriorating on Saturday. But not ending there. My first stop was the Tsankawi section of Bandelier National Monument. I wanted some photographs of the ruins for the recent past chapter of the book, and I also wanted to get some photographs near the type section of the Tsankawi Pumice. 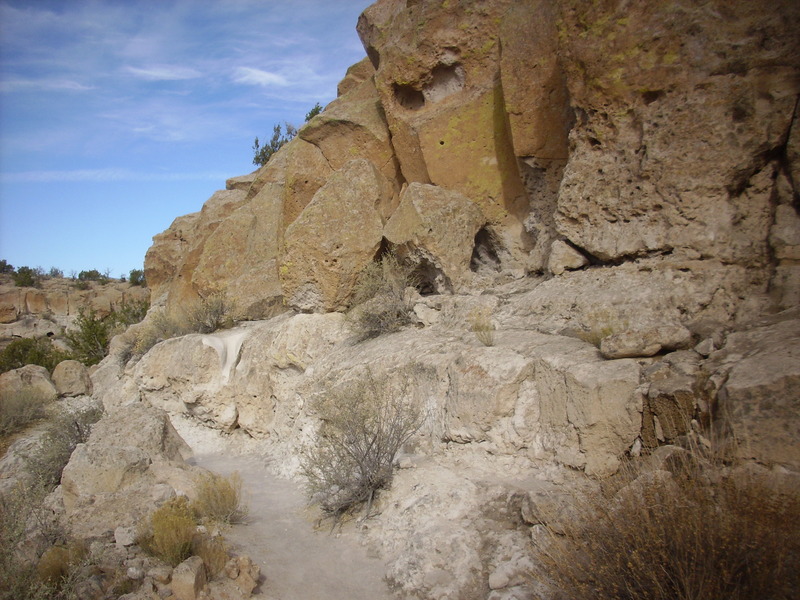 The Tsankawi Pumice is the air fall pumice at the base of the Tsherige Member of the Bandelier Tuff, which was erupted at the start of the Valles event, the great eruption that produced the Valles caldera. 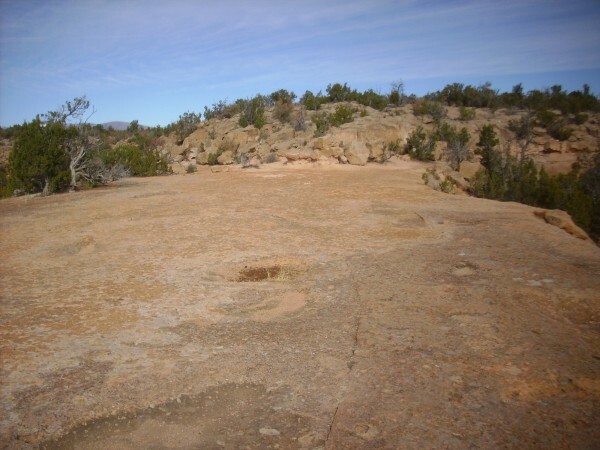 It was first named and described from its exposures on the south side of the mesa on which the Tsankawi ruins sit. The mesa consists of at least three cooling units, two of which are separated by the notch you can see near the top of the cliffs. These represent separate pulses of eruption, with enough of a time interval between them for the lower unit to cool slightly. Geologists do not believe the interval was longer than a few weeks at most, and may have been only hours. The bulk of the Tsherige Member making up the mesa is ignimbrite, a rock formed from pyroclastic flows. A pyroclastic flow is a mixture of tiny red-hot rock fragments and incandescent gas formed when high-silica lava containing ample dissolved gas reaches the surface. The gas comes bubbling out as a froth of microscopic bubbles, which cause the highly viscous lava to disintegrate. This mixture of hot gas and volcanic ash is heavier than air and flows downs the slope of the volcano, destroying everything in its path, before settling onto the surface and cooling into solid rock. The trail passes some outcrops of pumiceous tuff. The tuff here is full of fragments of pumice, possibly entrained from the Tsankawi Pumice that was already lying on the surface. 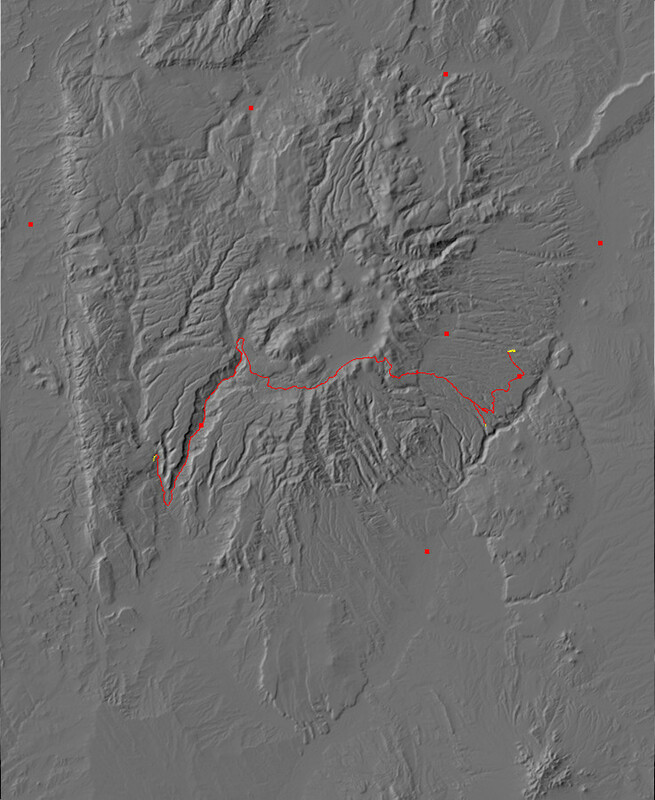 There are also some lithic clasts — fragments of solid rock likely torn from the eruption vents. The trail comes to a ladder that takes you to the upper surface of a cooling unit. The very flat surface here is natural. It is the upper surface of the lower cooling unit from the first photograph above. 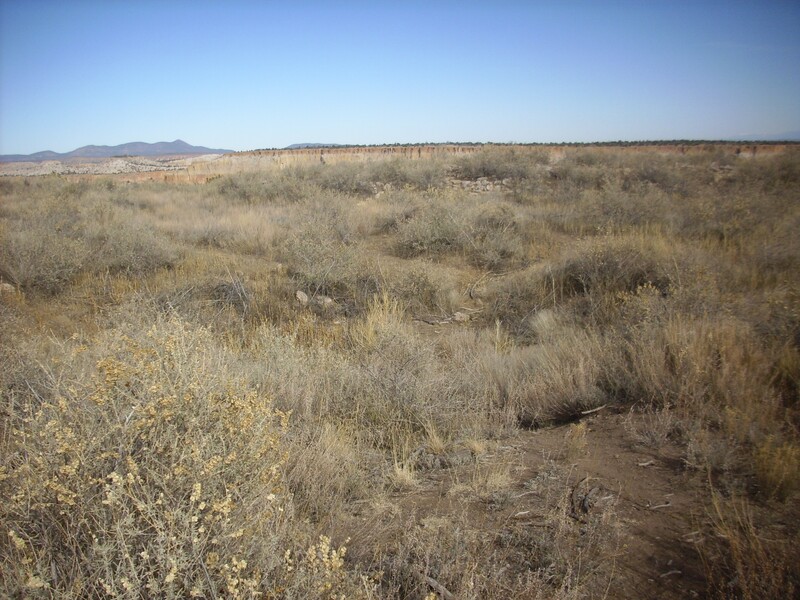 This surface extends along much of the south face of the mesa, providing a natural footpath. 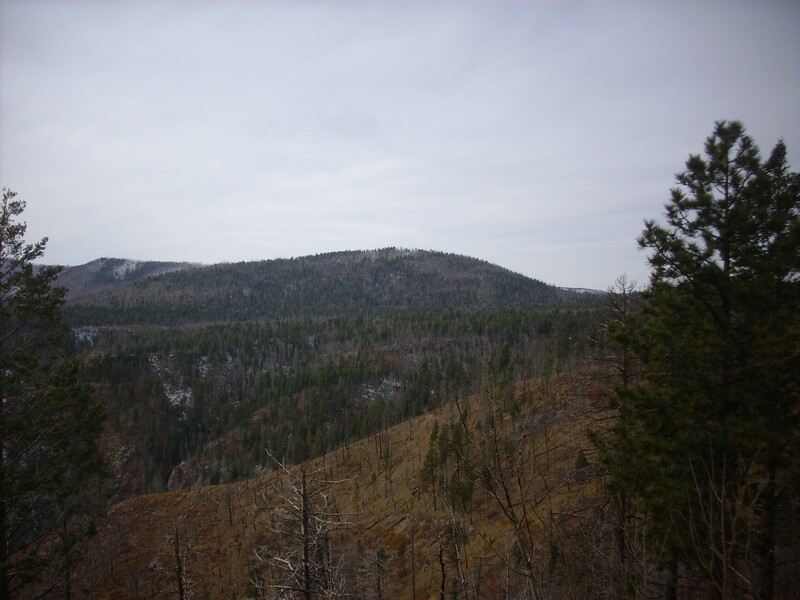 The next photograph looks back along this natural terrace towards Pajarito Mountain. That this surface is a natural surface formed at a cooling unit boundary is clear from where the cliff cuts across the boundary. You can see that the ledge becomes a notch in the side of the cliff. Behind the cliff, on the next cliff face, is the trail up to the mesa top. Here there is a caveate room with a kind of atrium excavated by the Ancestral Pueblo People who occupied this site in the 15th century. The shape of the atrium appears to have been largely determined by natural jointing in the rock, but the faces were probably smoothed off and the row of holes then excavated to seat timbers supporting a light roof. 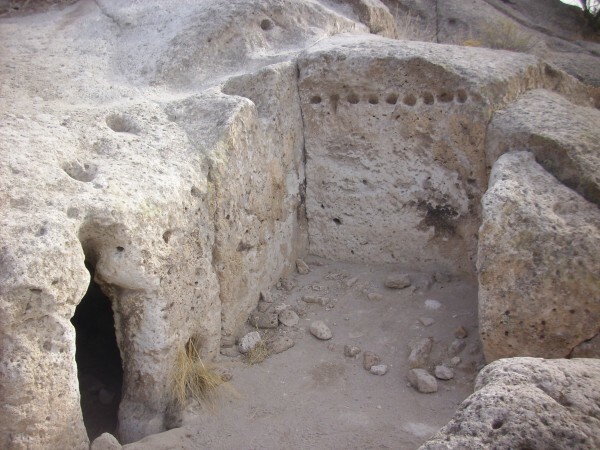 The opening to the left is into a caveate room, which likely started as a natural cavity in the rock that was further excavated by the Ancestral Puebloans. 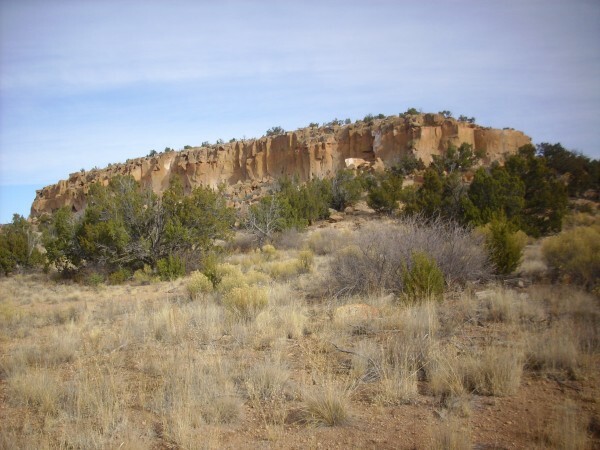 These people came to the area in the 15th century and were speakers of the Tewa language, rather than the Keres language of the settlements in the main section of Bandelier National Monument to the southwest. I was hoping to get to the base of the mesa to see exposures of the type section of the Tsankawi Pumice, and followed what looked like a little-used trail that might take me that way. Alas, it petered out, but this spot was a good one for photographing the mesas to the southwest. 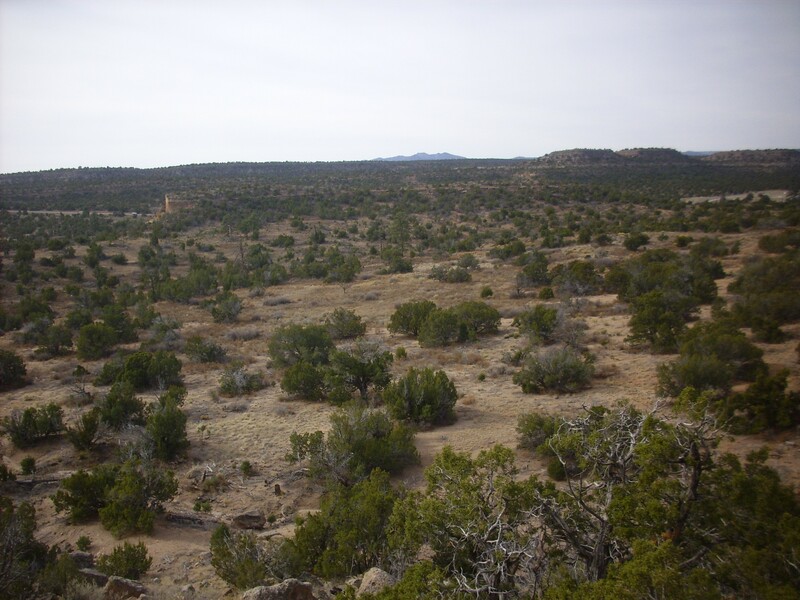 The cooling surface we’ve been hiking on clearly extends for a great distance, and is visible as a thin line near the tops of the mesas seen here. 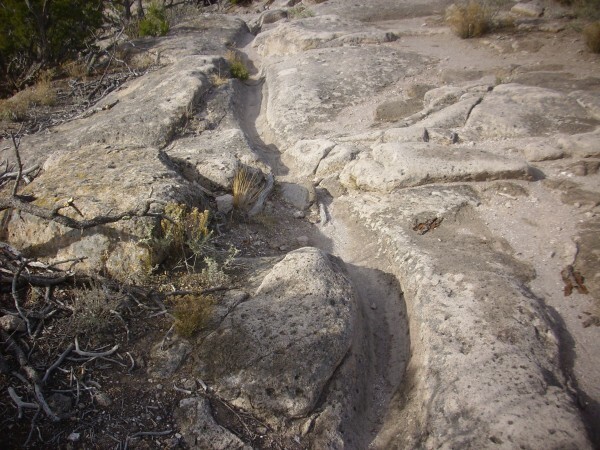 It is prominent in the cliffs north of White Rock, and I have seen what I think is the same cooling surface in Potrillo and Water Canyons southwest of White Rock. Oddly, I have not seen it called out in the many geologic papers I’ve read on the Bandelier Tuff, though other geologists surely must have noticed it. I’m going to dub it the Tsankawi cooling surface, for the consumption of myself and my readers. 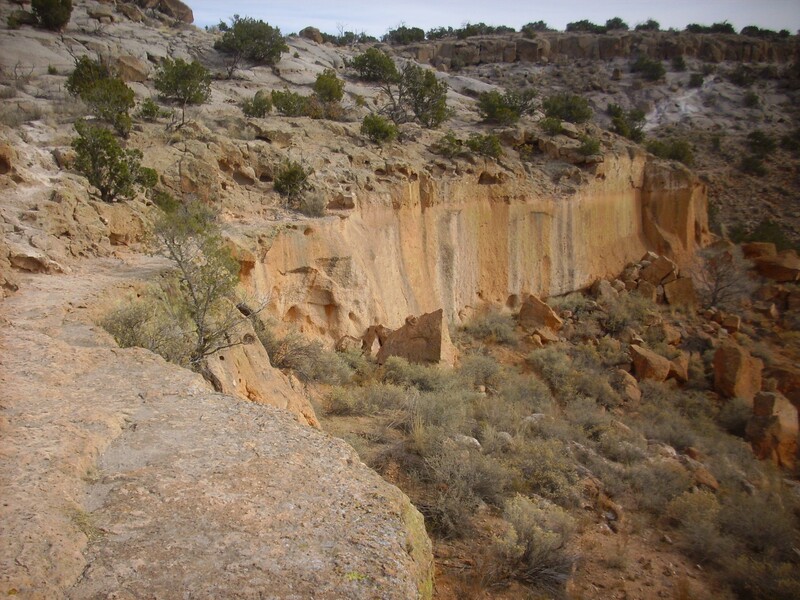 The main trail goes up the side of the cliff via tracks that date back to the Ancestral Puebloans. One might argue that these are freshly worn and do not necessarily date back five centuries. Well, it’s clear that they continue to be worn by tourist traffic, but they are nonetheless ancient. We’ll see other examples that clearly are not modern later on. This picture came out poorly focused, which is a real shame, because it ought to be one for the book. The thin layers below my car keys are a surge bed typical of the bottom portion of a single pyroclastic flow. My camera has been autofocusing poorly lately; but then it’s over 15 years old. They don’t even make memory cards small enough for it any more. I have a new one on my Santa wish list; I hope I’ve been a good boy. Anyway: Surge beds represent the relatively low-density front edge of a pyroclastic flow, which moves at great speed ahead of the flow and can surge over intervening obstacles. 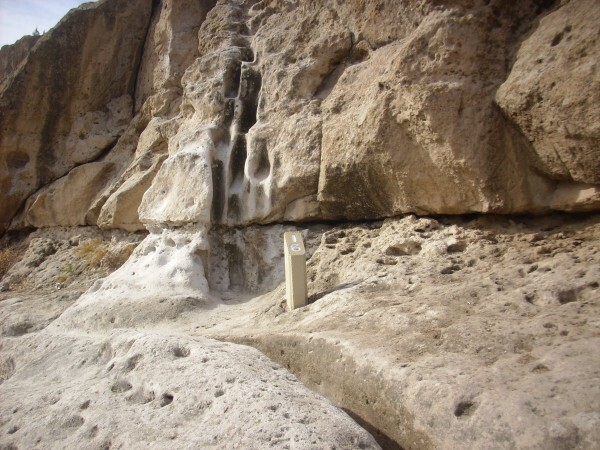 The boundary between these two cooling units is not everywhere marked by surge beds; in fact, it’s more common for it to be marked by a notch. 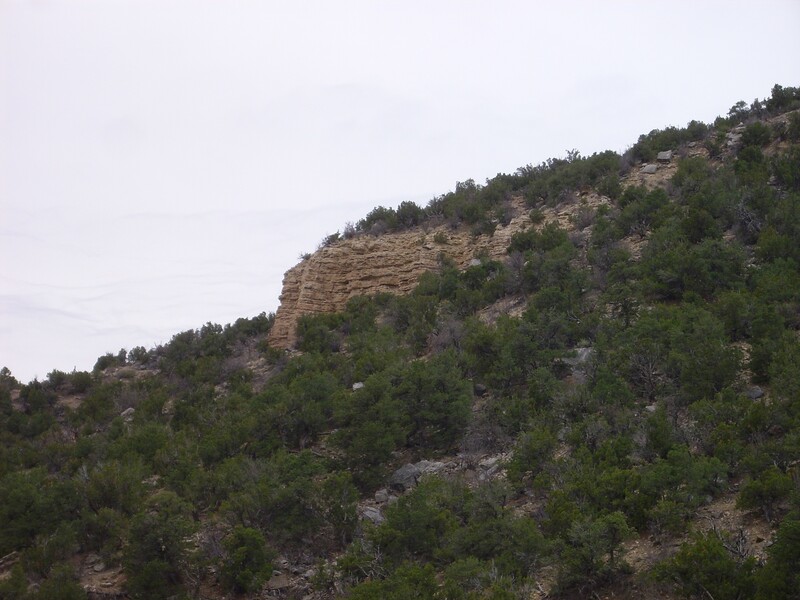 The Tsankawi Pumice is visible here as a thin white band filling a notch near the base of the cliff. Below are reddish beds of the Cerro Toledo Interval and then the colluvium at the base of the cliff. This may not be the type section (though we are in the right general area) and there’s no way down for a close look, but it’s the best I could do. Another photograph, just because it’s a pretty view. My Ansel Adams moment for the day. Except he had a better camera, grumble grumble. And, I know: I have a very nice Olympus SLR camera somewhere in my closet, with superb optics. I was given it shortly after graduating from high school by my parents, it cost a lot of money, and I haven’t used it in years because it requires film. Actual film, with silver halide grains in a gelatin layer that has to be chemically processed. Oh, I know, you can still buy film and have it processed, but what a hassle. Besides, I’ve decided that the secret to good photography, aside from a good camera, is taking lots and lots of pictures so that some turn out really well by sheer chance. That’s rather expensive with film. Notice that it’s getting overcast. Here’s a nice shot from just a little further down the trail. This is packed with features of interest. The ancient trail is visible at bottom, and goes right up the side of the cliff. The dark desert vanish proves this is an ancient trail. The notch between cooling units is clearly visible. And, though you have to click to enlarge and look closely, there are petroglyphs in the shaded area towards the right side of the image. Then up another ladder to the mesa top, where the ruins remain unexcavated. 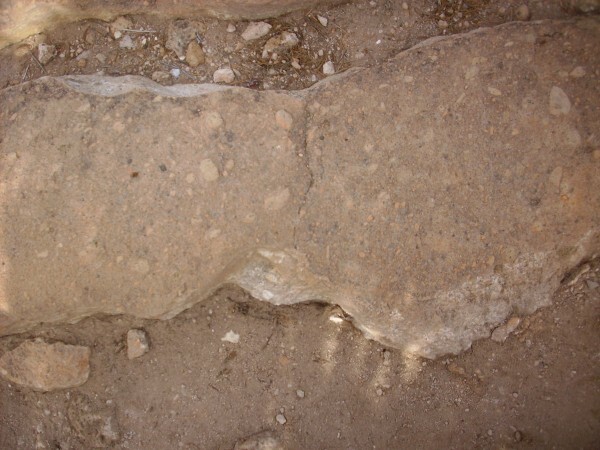 There are a number of archaeological sites around the world that have been left deliberately unexcavated like this. 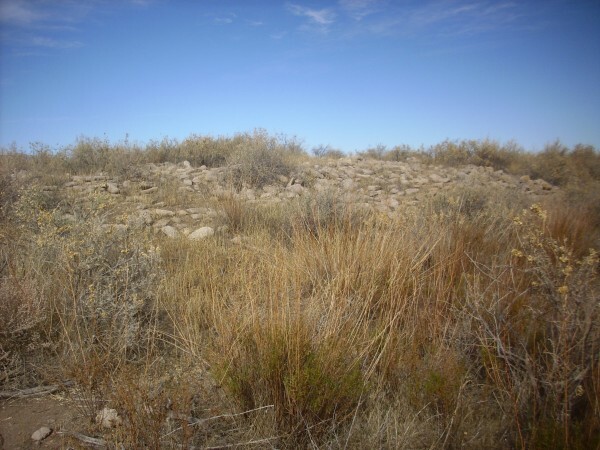 In some cases, it is out of respect for the feelings of identifiable descendants of the peoples of the ruins who are leery of having their ancestors’ ancient homes poked around. But in other cases, it is because the ruins are typical of a culture that has already been much studied, and are being left unexcavated against the day when better methods of excavation are invented. In the case of Tsanwaki, I suspect both reasons apply. I also noticed that the visible edge of the ruins on the ground are well within the area that looks visibly disturbed on satellite. I have no ready explanation. 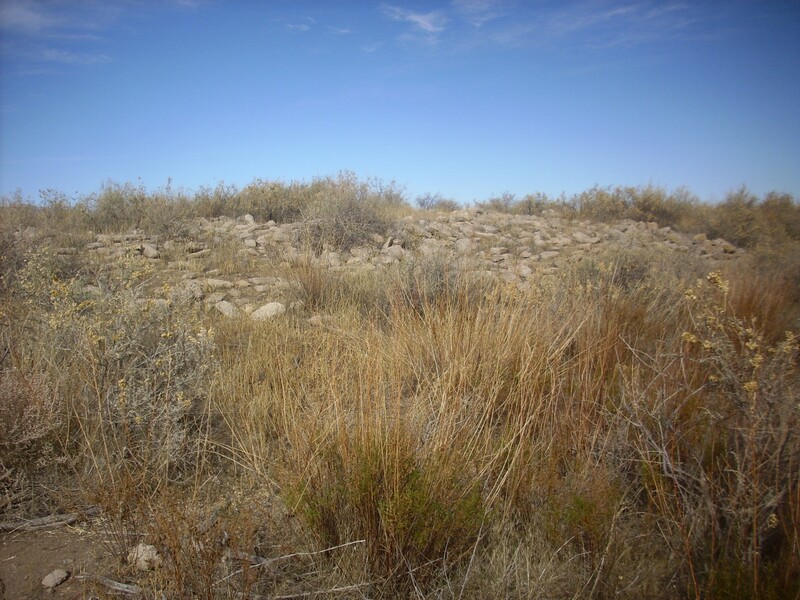 Within the ancient walls are at least two pits that are likely unexcavated kivas. Kivas are the underground ceremonial spaces of the Ancestral Pueblo Peoples. They are interpreted as scale models of the Universe, where heaven, earth and the underworld meet — as with temples in many ancient cultures. Time to head back; I had much more ground I wanted to cover today. I did pause on the trail out for a photograph of Caballo Mountain for the book. There is another ancient trail here, still coated with desert varnish in spite of years of modern tourist traffic. The fact that the desert varnish has not been worn away shows that most modern tourists do what I did — they walk on the higher ground around the trail rather that in the trail. This seems most natural. 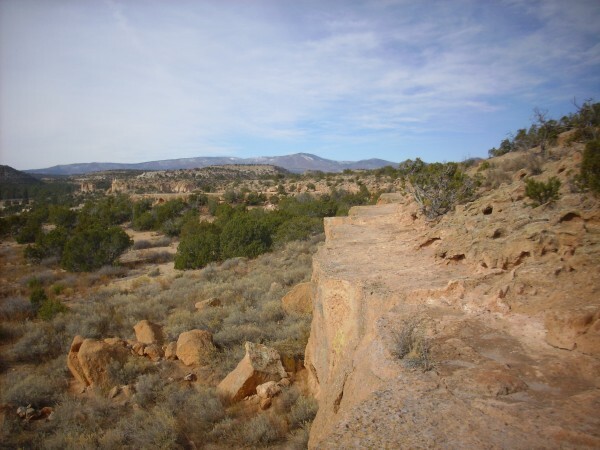 So why, then, did the Native Pueblo Peoples even create this trail? I have two theories. 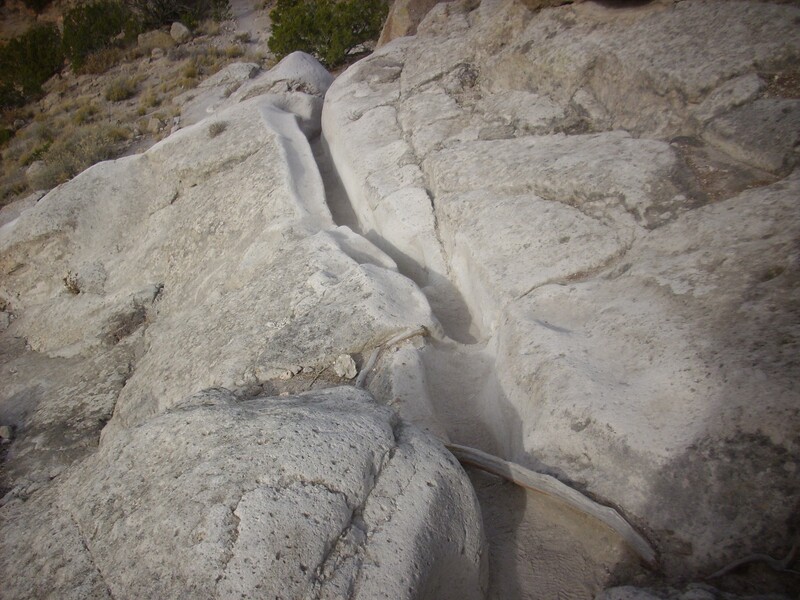 The first, which I put forward mostly to amuse my friend, Bruce Rabe, is that these are ritual trails. (The joke is that Bruce has commented derisively about the tendency of archaeologists to label any artifact they can’t figure out as a “ritual object.”) The second, which I know goes way out on a limb, is that this is a vehicle trail. No, no, no, I haven’t lost my mind. These ruts remind me very much of the kind of ruts you see on ancient Roman roads. Except that there is no evidence the Ancestral Pueblo People used the wheel, or any kind of vehicle except possibly sledges. I’m suggesting either this is evidence they did use the wheel or it is a trail for sledges. Here is a photograph of some more modern ruins. These are the ruins of the Duchess Castle, constructed for Vera von Blumenthal and her friend Rose Dougan in 1918. (Vera was actually a baroness, not a duchess, but the name has stuck.) The “castle” was actually living quarters and a school, built to educate the local Pueblo peoples in how to refine their pottery techniques to increase their commercial value and help lift the pueblos out of poverty. It’s a reminder of the high idealism of Western culture that was devastated along with much of Europe in the First World War. One last ladder to climb down. 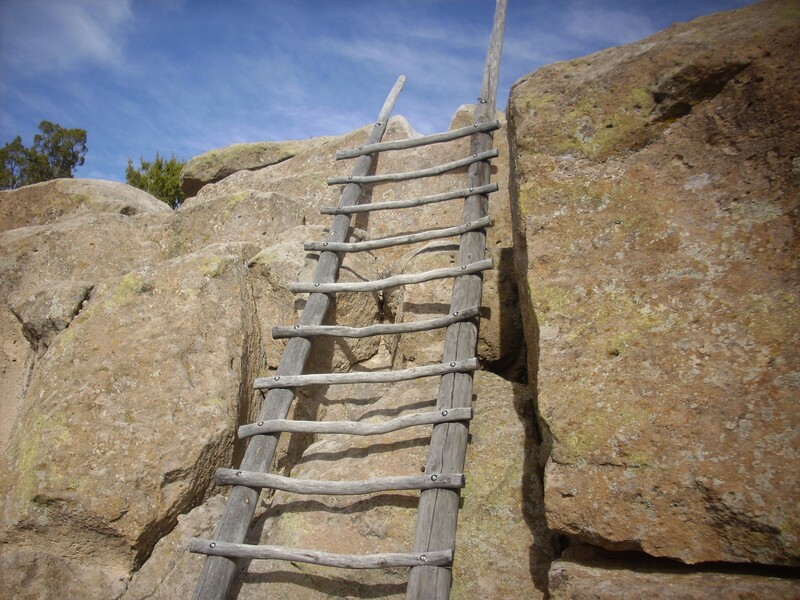 The ladders are of course modern, constructed by the Park Service to look rustic. It is likely the Ancestral Pueble Peoples constructed ladders to provide access to their kivas and the upper rooms of their pueblos, but the presence of trails down the steep cliffs near each of the modern ladders suggests that the Ancestral Puebloans did not use ladders here. Next I headed to the main Bandelier section. Friend of the Wanderlust, Angela Helm, suggested to me that I ought to visit the “lagoons” at Bandelier, which apparently attract quite a few birds. 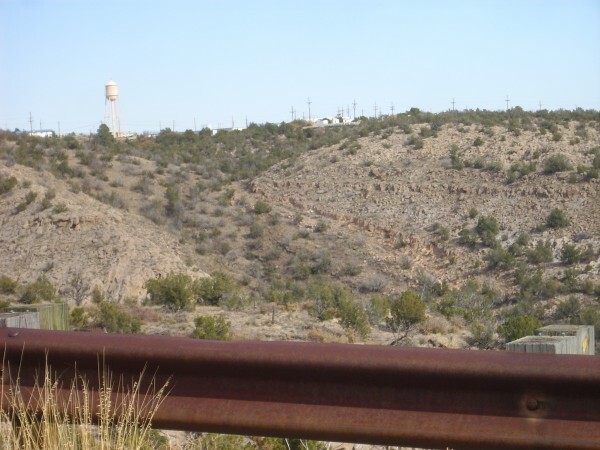 These are actually sewage treatment ponds, located at the top of the mesa northeast of Frijoles Canyon. 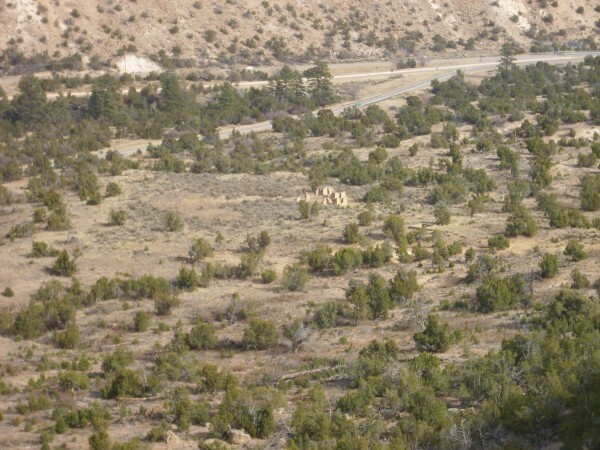 My interest was not so much the birds (though I do enjoy seeing wildlife) as the fact that, from the south tip of this mesa, one can see much further down White Rock Canyon than is possible from points north. 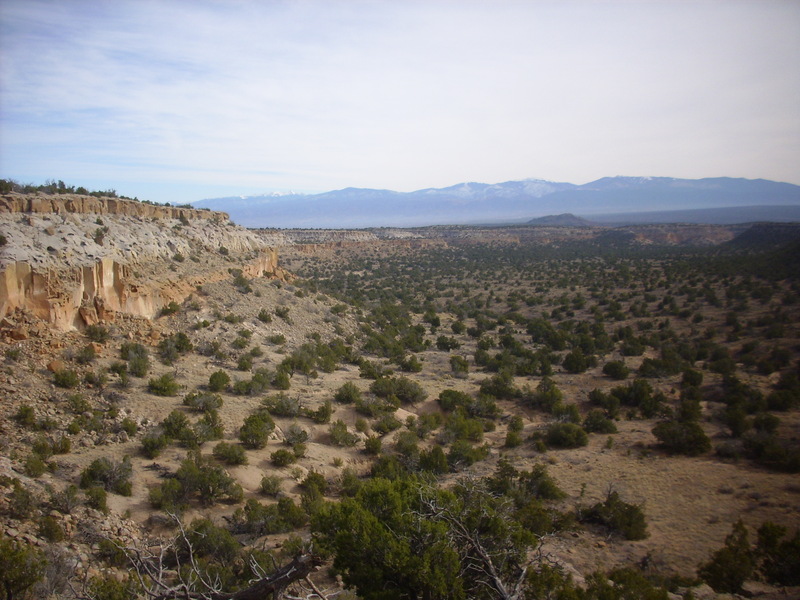 The view includes a rare flow of dacite from the Cerros del Rio that actually overlies a bed of Otowi Member, Bandelier Tuff. This is the sort of thing that interests geologists, because it shows that the youngest flows of the Cerros del Rio were erupted after the oldest flows of the Bandelier Tuff. It helps calibrate our radiometric dates for these rocks. This dacite flow is on public lands, but it’s a long ways from the nearest dirt road, over pretty rugged terrain. So I’m unlikely to get closer unless I rent a boat out of Cochiti. 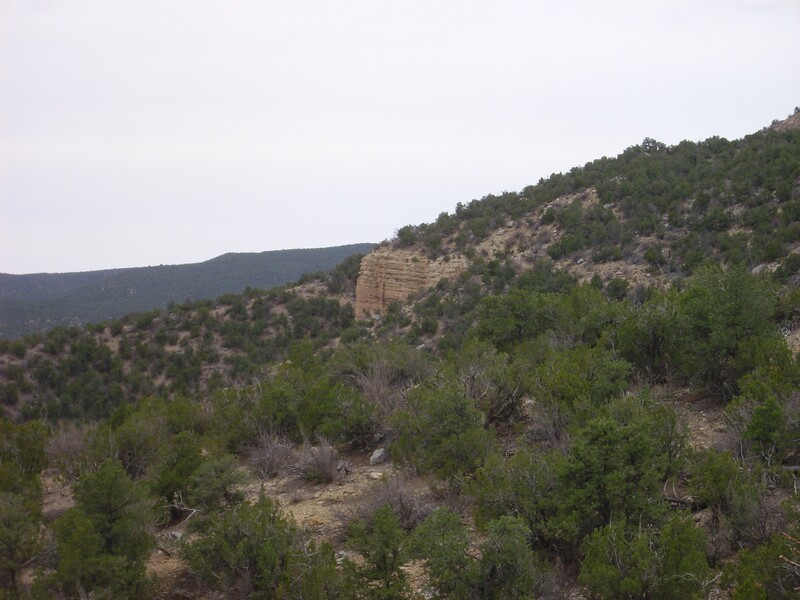 I paused along the entrance road to Bandelier to photograph a topographic high in the Cerros del Rio basalt that pokes through the surrounding Bandelier Tuff. The basalt is the area of dark ground at the center of the photograph. It has been dated at 2.39 million years old. The photograph illustrates how rugged the terrain was over which the Bandelier Tuff was erupted. I drove down into the main headquarters area, finding that there was really no good place to park and that pedestrians are prohibited on the road back out of the canyon. Well, shucks. I drove back to the overlook, parked there, ate my orange, enjoyed the view from the overlook for a few minutes, then donned pack and …Wait. The back wouldn’t don. Well, I could throw it over my shoulders, but the hip belt would not buckle. I must have slammed it in the car door at some point and ruined the buckle. Shucks and other comments. I headed off without my pack, took the road to the ponds, and found that this was very close to restricted DOE lands. The ponds were fenced off and I had to skirt the west side to get around both the ponds and DOE land. There were indeed still a few birds around, even this late in the season, including one likely golden eagle that soared majestically off into the canyon below me — faster than I could bring my camera to bear, alas. But the view into the canyon was worthwhile. This looks down into the Upper Falls area. Frijoles Creek is visible below center where it plunges over the falls, as is the trail in the canyon bottom. 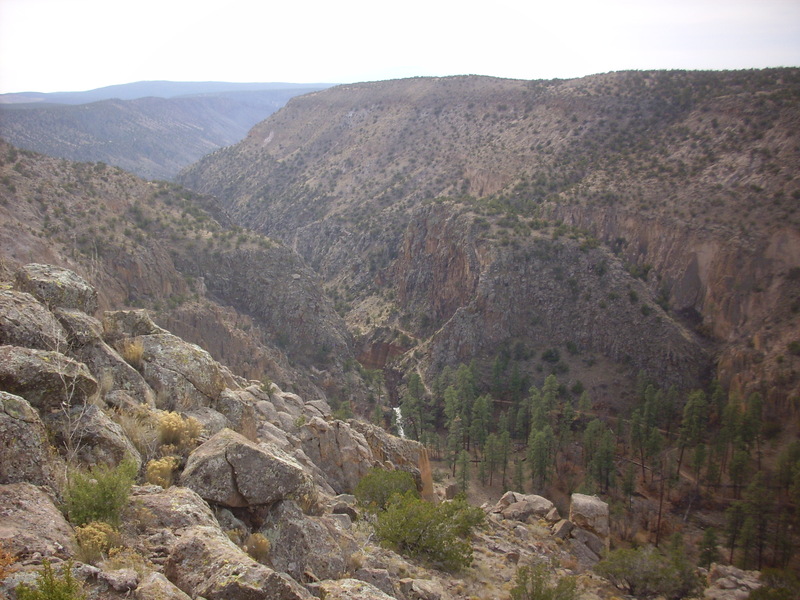 The dark rock around the falls is benmoreite of the Cerros del Rio, which overlies the maar beds visible at center in the canyon bottom beyond the falls. Overlying the benmoreite is Bandelier Tuff. Benmoreite is a synonym for sodic trachyandesite, a volcanic rock with an intermediate silica content and a high sodium content. A maar is a kind of volcanic eruption in which the lava erupts through beds saturated with water, producing violent steam explosions. 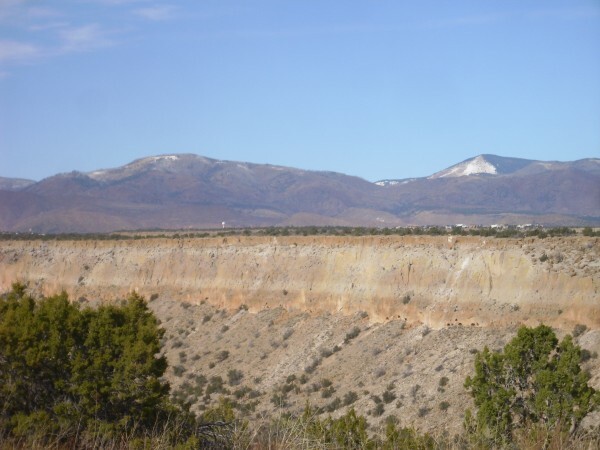 This suggests that an ancestral Rio Grande already flowed through the area when the Cerros del Rio first began to erupt. The Cerros del Rio Formatino was evidently already heavily eroded in this area 1.2 million years ago, when the Bandelier Tuff erupted over it, and the area to the right of the photograph shows the Bandelier Tuff filling a deep paleocanyon in the Cerros del Rio Formation. 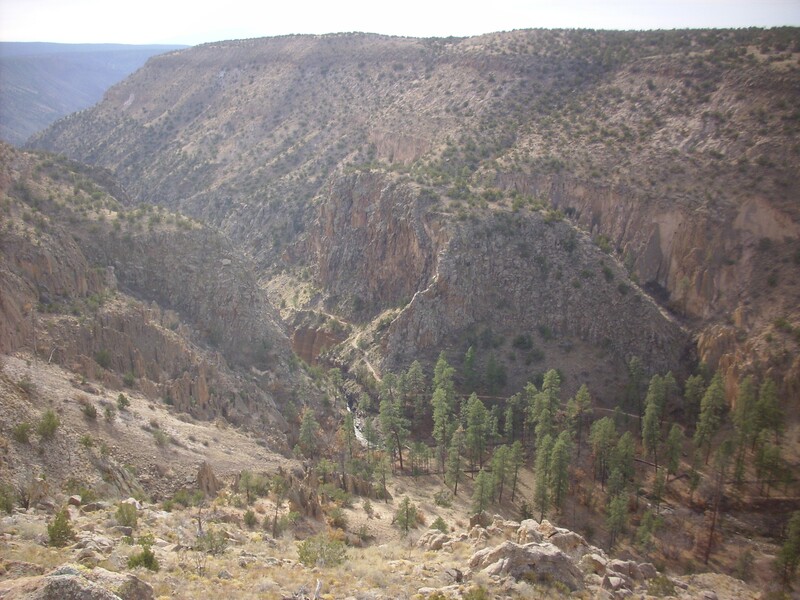 This particular paleocanyon has been interpreted as the previous course of the Rio Grande, prior to the Bandelier Tuff eruption. Further on, and another view. Not too different from the previous, except that you you can see tent rocks in the east canyon wall, on the left side of the photograph. 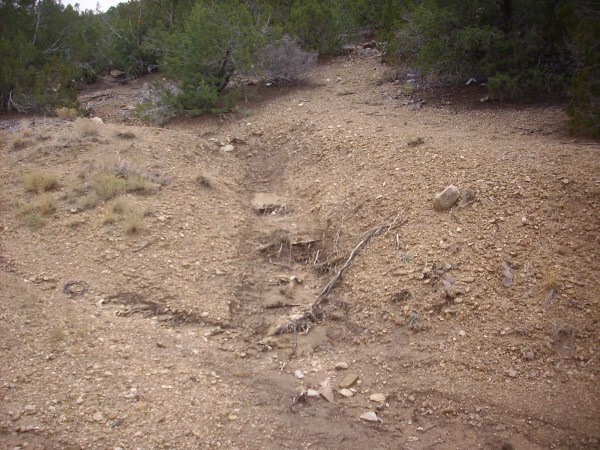 According to the geologic map, this is a partially exposed cinder cone of the Cerros del Rio Formation. I’m going to have to go explore it more closely some time. And then I found a deep ravine across my path, and the head of the ravine was across the fence onto DOE land. There was no getting past it. 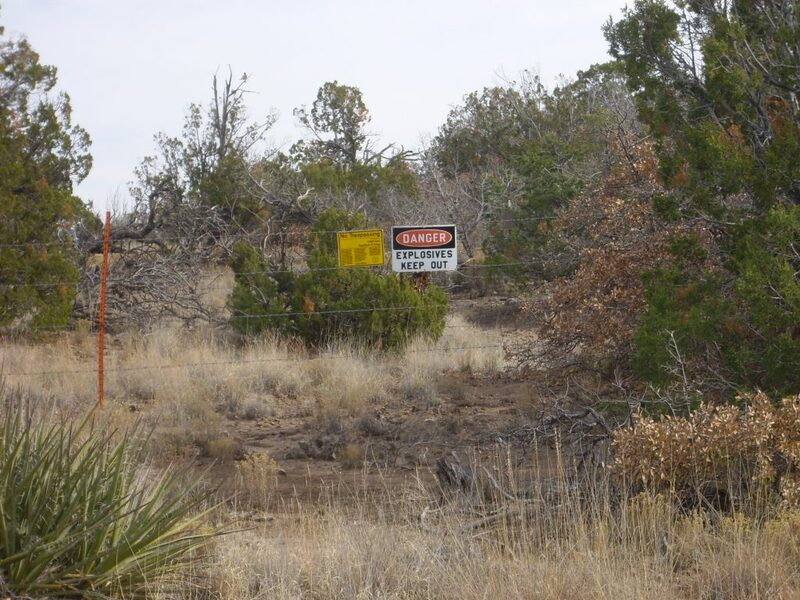 Turns out the south tip of the mesa that I wanted to hike to is also on restricted DOE land. I should have checked the jurisdiction map before heading out this way. 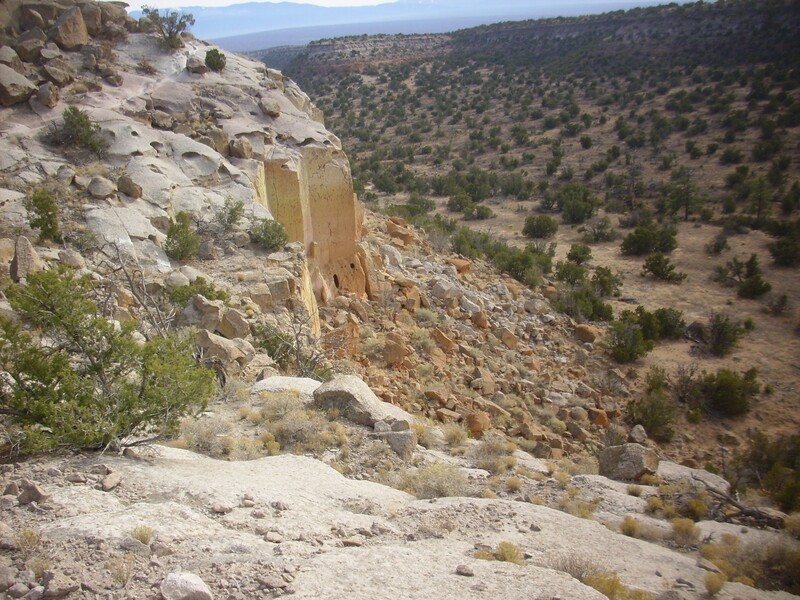 So I headed out on my last leg, way off to the southwest Jemez to check out the Gilman Conglomerate. I paused along the way for another picture for the book, of Sawyer Dome. Sawyer Dome has been dated to 3.6 to 3.4 million years old and consists of a lower bed of andesite and a cap of dacite of the Tschicoma Formation. It’s part of the southeastern rim of the Valles caldera. And then across the caldera, down past Jemez Springs and onto Forest Road 485 to Gilman. From here I got a very nice shot of the Gilman Conglomerate. The rock column here is pretty interesting. At bottom are red beds of the Permian Abo Formation, some 300 million years old. Above are very pretty beds of the Gilman Conglomerate. 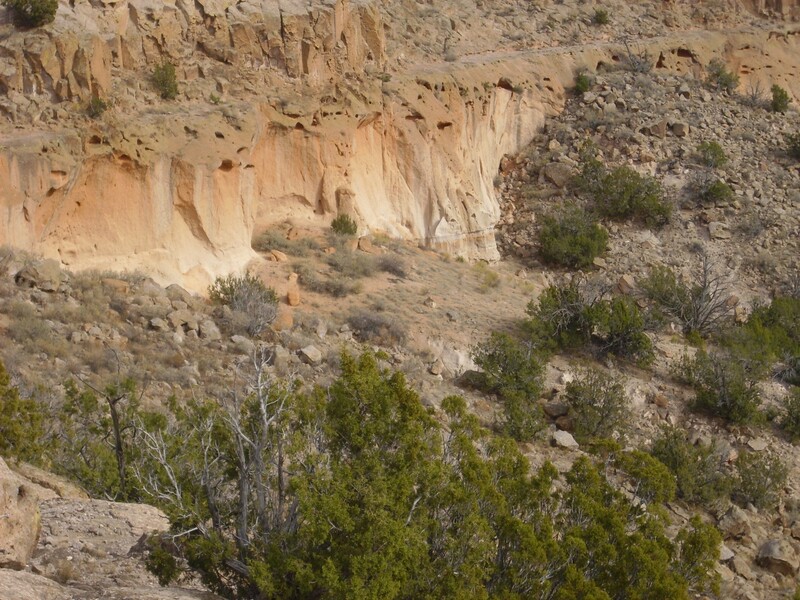 Above those are younger gravel beds, then a mesa of Tsherige Member, Bandelier Tuff. We know that the gravels must be older than 1.21 million years, since that’s the age of the Tsherige Member, but it’s very hard to date gravels. The individual clasts in the gravel are Paleozoic but that just tells you how old the rocks they eroded from are; it doesn’t tell you when the beds formed. Same for the Gilman Conglomerate, though it’s clearly significantly older than the gravels. It has the look of volcaniclastics, and is mapped as such in the quadrangle map for this area. The clasts in its uppermost beds have a minimum age of 25 million years, similar to the Ritito Conglomerate (lower Abiquiu Formation) of the nothern Jemez. Geologists now believe that the Gilman Conglomerate correlates with the Ritito Conglomerate. I wanted a closer look. There is a forest road into the area from just south of the Guadelupe Box; I parked there and started off. I know: Very exciting. But the presence of large beds of rather well-sorted gravel in this area is kind of geologically interesting. Not all the gravel in this area is this well sorted, as I’d see later, and perhaps this is a terrace deposit from the nearby Rio Guadelupe. Further up the road: Locally-derived anthrogenic colluvium. Now I know why the forest road had a big berm across it. 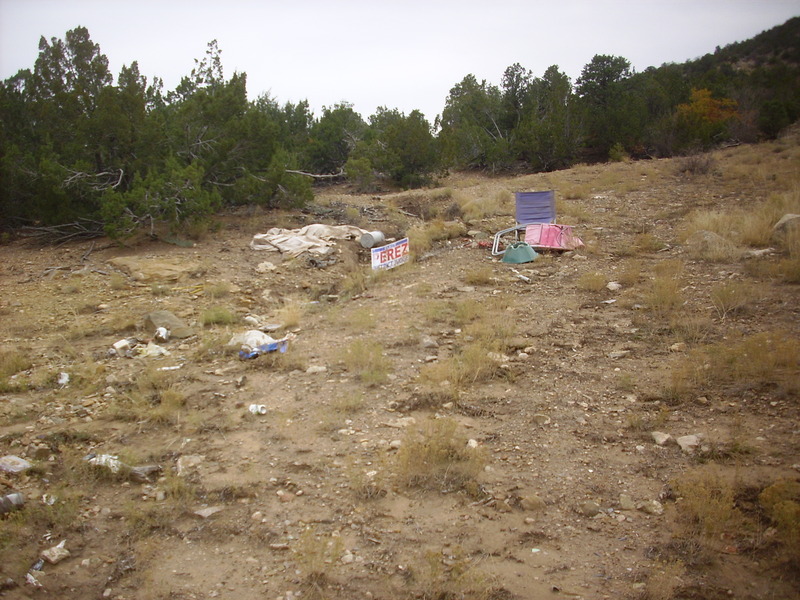 It was to try to discourage people from using this area to dump their trash. Right around here I found my first big boulders full of fossils: Crinoid stems and brachiopods. The pictures didn’t come out. (Blasted balky autofocus.) Well, I was still hiking through the gravel beds, so I wouldn’t have known what formation these came from (though likely Madera Formation) and the fossils weren’t that great. 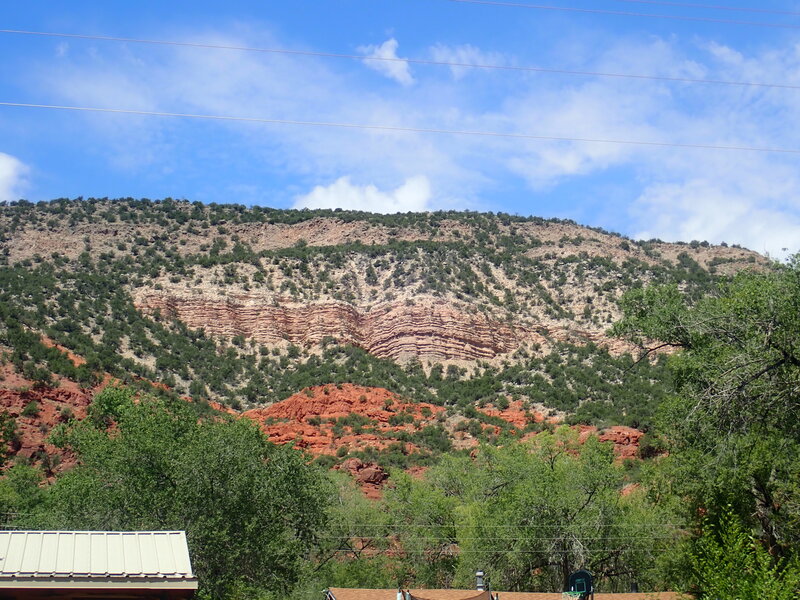 Further on, and I just had to get a photograph of the fault trace across the canyon. The fault trace is just right of center in the photograph. At right are massive beds of the Permian Mesita Blanca Formation, Yeso Group, overlying slope forming beds of the Abo Formation. 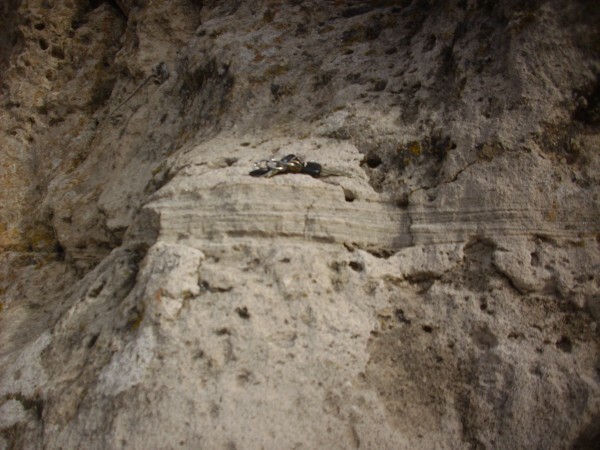 At left, thrown down, is the Mesita Blanca, overlain by fluvial beds of the San Ysidro Formation, Yeso Group; a thin light band of Glorietta Formation; a thicker dark band of Triassic Moenkopi or Bernal Formation (depending on who is interpreting it); and a final lighter layer of Shinarump Formation. Overlying both are undisplaced beds of the Bandelier Tuff, showing the fault has not been active in 1.65 million years. Note that there appears to be a paleoescarpment on the fault trace, but, oddly, the high side is the downthrown side of the fault. 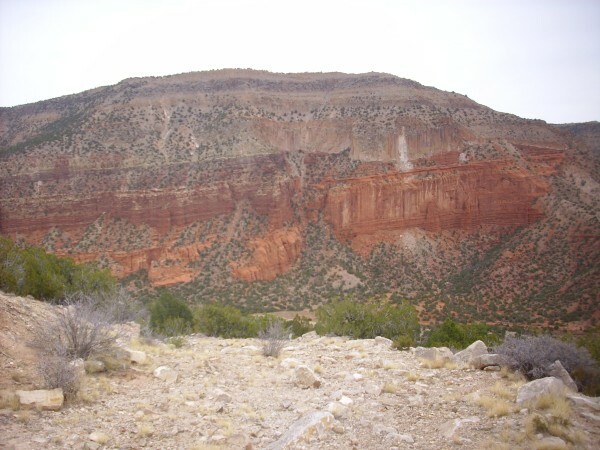 There is some evidence of fault reversal on many faults in the Jemez area, as the compression of the Laramide Orogeny gave way to extension around 30 million years ago; this may be an example. Or the apparent paleoescarpment, isn’t, and this is an antithetic fault to the larger Sierrita Fault just to the north. Dunno. About this point, and working from the rather large-scale geologic quadrangle map for the area, I started cutting south off the road. There was the exposure ahead. I shaped course that way. Alas, there was a rather deep ravine across my path. (They always look so innocent on the large-scale map …) It wasn’t completely impassable, but it would take a lot of time, and it was already mid-afternoon. At least I got close enough for a really good photograph. Had I been working from the aerial view, I would have discovered that there is a side road taking almost directly to this area, but I left the main forest road before I got to it. Because it apparently postdates my geologic map. Sigh. I worked my may down the arroyo rim, because it looked from my geologic map that I might find some exposures of the Gilman Conglomerate in the arroyo. Alas, no luck. I started back. Along the way, at about the right stratigraphic level, I found some poorly exposed conglomerate outcrops that looked suggestive. Alas, they didn’t photograph well; one turned out to be full of fossil shells, making it much older than the Gilman Congolomerate; and the other looked like it might be shale of the Sandia Formation. Well, confusticate and bebother. I hiked back to my car and huffed home. At least I got some nice photographs, just not of anything I really wanted to. Didn’t get close to a good exposure of Tsankawi Pumice at Tsankawi; didn’t get to the south tip of that mesa at Bandelier; and didn’t get close to the Gilman Conglomerate. But at least I got some nice distant shots. Sometime you find you get what you need.